About This Blog | Topic "Otaku"
Basically in my blog I cover mostly animes I watch and games I play, along with any other Japanese pop culture topics that come up. This blog will be about the Japanese subculture, topic “Otaku”. This includes anything related to anime, Japan related events, video games, etc. While I don’t call myself an Otaku, I see myself more as a Japan enthusiast because I’m not overly hyped to buy tons of figures and manga (though I still like to have some loot), but at the same time want to learn more about Japan itself and it’s culture, like the kinds of things that are depicted in animes. 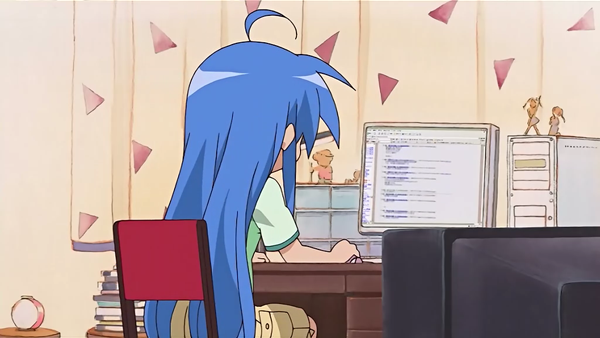 I like to blog about the various animes I watch and what I think of them because each brings a different experience and emotion to how I view life itself, and I want to share that with others to connect with them in a personal sense. The otaku culture may seem very “kid like” at first glance, but all the same has some relevance to real life, just like how American cartoons has some real life references too. I like anime and manga because it shows the type of life I could have had, not a life filled with anime, but with the lessons and experiences that each illustrate. I also will cover other topics related to topic “Otaku” when they rise up. Along with the information about what this blog is going to be about, here is a general explanation about why I blog (from xanga.com/coolmikeolgx). PS: This info was edited Jan 2011 and is now not a direct quote from the stated website. For the years I’ve been blogging on any place on the internet, they have been pretty much about me, like a diary of sorts. I been thinking about writing small articles about stuff I see around me and on the media, and about the small things in life we don’t think about too much but would laugh about when talked about. I am taking a page from the book from my favorite blogger, Danny Choo, a guy from Europe who now resides in Japan who writes about the Culture of Japan and also about his life there. (Visit his website! http://www.dannychoo.com) Ever since reading his blogs and photo articles for a while, it made me think about the slice-of-life things I see here, and how it may be “normal” here but looked at differently halfway around the world. Actually I did write in the same style of slice of life back in my old blogs, it’s a bit funny how I did write back then. My old blog is http://www.xanga.com/coolmikeol if you really want to see but there is nothing important there as it was all from my high school days. I have an interest in sharing the little and big events in our lives’, think of it like worldwide pen-pals. Hope you enjoy my blog as much as I like writing them and sharing them to the world. Interesting blog you have here! I feel that I think much in the same way that you do, and I specially liked the “..because each brings a different experience and emotion to how I view life itself..” part that you wrote, because I strongly agree with that. I do not view my self as an otaku myself, but I do love Japan and its fantastic culture.